Santa Claus' North Pole World Christmas Parade! Tonight, the elves from different countries put on their big parade. It is one of the happiest of all the parades. Every year we have different countries in the parade (the elves have to take turns after all!). Would you like to hear more about the parade? Of course, there has to be something along the parade route so everyone knows where to stand. So, the elves put up strings with little flags from all the countries. This year the elves from Australia were first. Those silly elves wore bathing suits. They pretended to be at a snow-white beach. (OK, it actually was a snow-white beach — because it WAS snow! 🙂 ). Clumsy the Elf even pretended to go surfing. You can imagine how good he was at it! He did some pretty crazy wipe-outs right into the snow! It is too cold here for the six white boomers (kangaroos) I use to pull my sleigh in Australia. So the elves dressed up like them. They even had the baby elves in their pouches! Finally, there was a float with elves doing “Carols by Candlelight“. Then came the girl elves from Sweden. They looked very pretty. They were dressed all in white and they wore crowns of candles. It is something they do for St. Lucia Day too. The elves from Norway made lutefisk. Then they ran around trying to find someone to eat it! Everybody laughed! The Caribbean elves do a Junkanoo carnival for us. Can you see them in the photo? They have lively music. They have very fancy floats. The dancers wear really fancy costumes too! They get everyone up and dancing. I always get up and dance too. Yes, even old Santa Claus can “shake his booty”! Ho! Ho! Ho! Isn’t it fun what people do at Christmas around the world? They sure do many different things! Would you like to see more of the world at Christmas? Then go to my “Christmas around the World” webcam page to see more! it christmas eve tomorow i am really exited i want a bmx i am a tom boy. Hi Santa, thanks for everthing,and that letter! Santa is a wonderful men thankyou for bringing us preasent’s for christmas thakyou for reading this. I think you should work harder santa. I think that santa needs to rest for the rest of the year. can you make it snow in Vancouver Washington? please????? I hope it’s not too tiring for you to get ready for this special day!!! We’re sending you a HO! HO! HO! 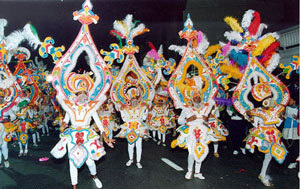 from the Bahamas…We’re getting ready for our Junkanoo Parade this year…Come and enjoy with us! Lots of Love and Merry Christmas! hi santa i have been writting to you on emailsanta.com.and you told me to come to this blog so i did you are my bff (best friend forever). I have family come over and eat supper and OPEN PRESENTS! What fun I have been having navigating through this site. I so love Christmas. Although this is not a nature site, it is the Nature Site of the Week at Nature Center Magazine. It will first appear on December 21.
hey santa how are you i am so happy that it is christmas are you happy that it is christmas and will be looking foward to you coming to my house on friday night. Santa, you should get yourself a present yourself! You ARE a NICE guy EVERY year so you deserve a present too! You’re never NAUGHTY! Wow! Every Christmas, I make a red velvet cake. YUM! Ih santa how are you doing today if your doing nice that is good. lol that is so funny santa claus i love your blog. I agree with Jacob AWESOME hey waz up santa rudolph elves mrs.clause 5 sleeps till christmas. That sounds like an AWESOME parade!Hi ELVES! Hey MRS. CLAUS! WHAT’S UP SANTA! I blevn in you and teall me all about your reindeer and HI. P.S. There probaly was a billion elves there performing! What I like to do is… I like to site bye the fire and eat smores! i thought you couldnt take pictures of elf’s?can you post a picture of a baby reindeer? santa are you checking your list twice.merry christmas. what is it like in the world christmas parade? I would like a blackberry curve for christmas, i have been a very good girl! We do it the American way, since we live in America. I would love to see how people celebrate Christmas around the world! I’ll research it right after I listen to JINGLE BELLS. Hi Santa! I have been a really good girl this year ( i think ) but your the one who REALLY KNOWS….. 🙂 I love you Santa Claus. Your parades Look very Fun. I wish i was one of those paraders! by the Way i really enjoy all the wonderful christmas you send to me and my briothers and sisters and cosions and friends they all really enjoy it! That sounds very exciting!! I wish I could se the Christmas parade with YOU!!!!!!! I love your blog. I love pearades! That is the coolest thing in the world! I hope you enjoy the Christmas Parade! I forgot to tell you in my letter that I am losing my second top tooth. It should fall out before Christmas. And all I want for Christmas is my 2 front teeth! Just kidding, i wouldn’t mind a toy ot two that I asked for in my letter. Hi Santa hope you enjoyed your parade. Bet the elves are tired, tell them to get moving people wan’t presents on christmas day so tell them to get moving. And anyway hope Rudolf’s OK,too.Well better get going enjoy the big journey. Thanks for this website. I really enjoyed helping my kids fill out their email to Santa. They were overjoyed to get the response so quick. Thank you again for helping spead the magic of Christmas to my family. Wow a world wide Christmas Parade! Dear Santa you are the best in the whole wide world!! this year do you think you could visit the poor children out there for me. Next PostNext Santa Claus’ Naughty and Nice List. Which List R U on?